This complex in the Northern Cemetery of Cairo is one of the largest and best-preserved monuments from the era of Sufi Mamluk rulers in Egypt. Sultan Faraj, having ascended to the throne at the age of 10, ordered a funerary complex built as a tribute to his father, Sultan Barquq, in 1398. The site’s design grew to also include schools, sleeping quarters, a mosque, baths, grain mills, and a market. Some scholars posit that an additional purpose of the site was an attempt to urbanize the desert, one of the region’s first attempts at that. 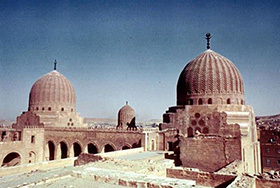 The site is particularly famous for having the two largest and oldest chevron-carved stone domes in Cairo. The square complex is unusual in having a symmetrical pair of domes, minarets, and other buildings laid out in a bilateral fashion. There are two of everything so men and women can be buried, pray, live, and study separately.